Dynamically procrastinate B2C users after installed base benefits. Drammaticaly visualize customer directed convergance without revolutionary ROI. We have a number of templates to get you started. 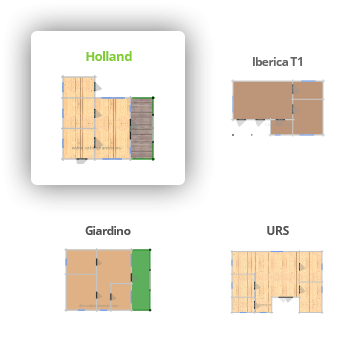 If our templates do not meet your needs, then start from the most basic template.After you choose a starting point, next step is to set the wall thickness of the house.Then you can drag and draw walls to achieve desired external measures and layout of the house. When external and internal walls are finished you can start drawing terraces. A terrace can be drawn with different measures, with or without fences. Terraces can also be with roofing above or just with terrace boards. Entrance to the terraces can be set according to your needs. 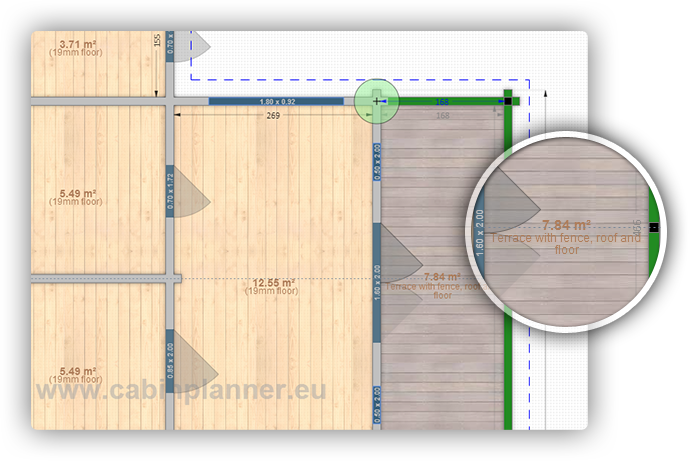 Cabinplanner® also alows its users to plan a loft area above the whole house or some parts of it. After you draw your walls, loft and terace you can start placing necessary doors and windows. Doors and windows are placed very easily by dragging and dropping them to the desired location. If positions of windows or doors need to be changed, they can be easily moved over the wall. Clicking on a door allows you to choose the opening direction and or opening side. Doors and windows all are double glazed with 4mm+16mm+4mm glass. 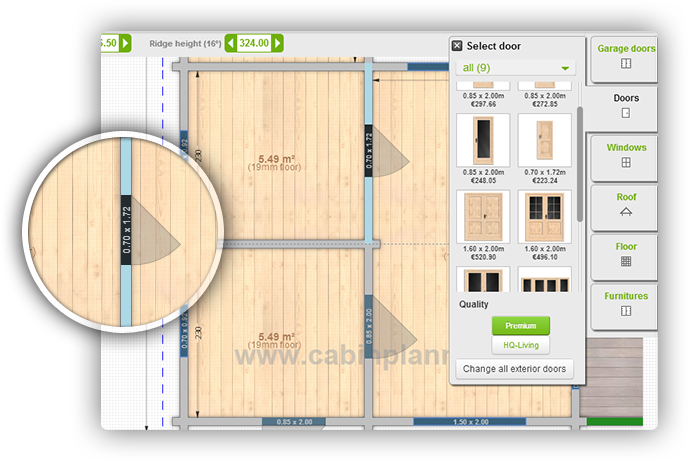 Also Cabinplanner alows you to choose different qualities of window and door frames. You can chose a basic high quality summer house type windows and doors or European standard living house windows and doors. While the house is being designed you can see real-time changes on the four sides of the house in the previews on the left of the screen. Clicking on the preview icons on the left side window can give you a closer look to any of the 4 sides of the designed cabin . It is a great apportunity to review exterior look of you dream house and make some changes. Also on those sideviews, you can change the location of the ridge, if applicable. The algorithm of the application will decide where you will be allowed to place the ridge of the house. After and during the drawing and designing of the house you can see the final price. 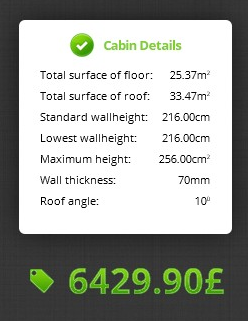 Also in the same section in Cabinplanner® you will see the cabin's details: square meters of the floor and roof, ridge height, wall height and roof angle. If house designs are finished you can choose to save them in your account and export the information to a PDF file with the details of the house with its price. All saved designs have a unique serial number, for easy comunication between customers and sellers and production.